The Beta 87A on the UR2 transmitter features the Beta 87A supercardioid condenser microphone head which gives you studio quality sound and is tailored for lead vocals for live performance. It also provides maximum isolation from other onstage sounds. 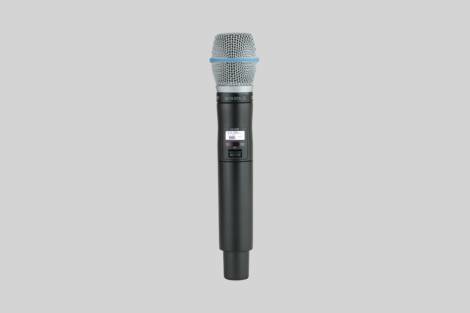 The flagship UR2 Wireless Handheld Transmitter offers the most advanced features and controls including a bit-mapped backlit LCD display, infrared automatic transmitter sync and switchable RF power. It also has frequency and power lockout cabability and can be used continuously for up to 8 hours using 2 x AA Batteries (included). The UR2 is made from an all-metal die-cast construction for maximum durability.